LYMMO is your answer to navigating downtown Orlando. Glide through downtown in the air conditioned comfort of a LYNX bus. Traveling through downtown Orlando in its own dedicated lane and controlling stoplights throughout its route, LYMMO is guaranteed to get you from one point to the other fast. Next time you plan to see an event at the Amway Center; party at the nightclubs along Church Street; dance to live music in the Wall Street district; visit the art galleries on Pine Street; or dine at the wide variety of restaurants that make downtown such a tourist hot spot, ride the LYMMO Bus. All LYNX buses are wheelchair accessible. No paying for parking downtown. Monday – Thursday: 6:00 a.m. – 10:45 p.m.
LCS Lost and Found - Monday-Friday 8 a.m.-5 p.m.
LYMMO Orange-Downtown serves LYNX Central Station to Downtown and back to LYNX Central Station. Buses operate 5 minutes during off-peak, 15 minutes evenings, weekends and holidays. Destinations along the way: Centroplex Garage, OCPS, LYNX Central Station/SunRail, Bank of America, Orange County Courthouse, US Post Office, History Center/Library, Church Street, Dr. Phillips Performing Arts Center, City Hall, SunTrust, and North Quarter. 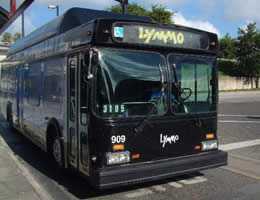 LYMMO Lime Line operates along Amelia Street, Hughey Avenue, Washington Street, Division Avenue, West Central Boulevard and Garland Avenue serving Parramore and the west downtown Orlando area. Destinations along the way: LYNX Central Station/SunRail, OCPS, CentroPlex Garage, Bob Carr Theatre, FAMU College of Law, U.S. District Court, Orlando Police Department, Connections to LYMMO Orange - Downtown line at Garland Ave and Amelia Street and connections to LYMMO Grapefruit line at Central Blvd and Garland Ave.
LYMMO Grapefruit Line operates from Amway Center to Lake Eola. Buses operate daily every 10 minutes during office hours, 15 minutes evenings, weekends and holidays. Destinations along the way: Parramore, Thornton Park, Federal Courthouse, History Center/Library, Lake Eola, Dr. Phillips Performing Arts Center, City Hall, Amway Center, SunRail, Camping World Stadium (game days only), Orlando City Stadium and Orange County Health Department. LYMMO Orange - North Quarter Line serves the North Quarter area. This route operates in a loop along Livingston Avenue, Magnolia Avenue, Marks Street and Orange Avenue. If needed, transfer to the LYMMO Orange-Downtown at the Orange County Courthouse Station. Buses operate every 15 minutes throughout the day, evenings, weekends and holidays. LYMMO will be operating a holiday schedule on Christmas Day and will resume regular scheduled hours on Wednesday, December 26. LYMMO will be operating a holiday schedule on New Year's Day and will resume our regular scheduled hours on Wednesday, January 2, 2019.